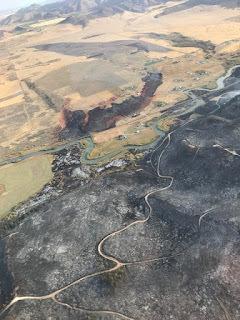 Updated Status: Activity on the 8 Mile Fire died down during the night as cooler temperatures, higher humidity and light winds reduced fire spread and intensity. Air attack estimates the fire at 1,016 acres. Two trailers and two summer homes were lost in the fast moving blaze. Fire officials were able to obtain an additional 20-person handcrew, which will be critical in securing the fire’s edge in some of the more difficult terrain. In addition to ground resources, two helicopters will be used throughout the day to reduce hot spots and limit fire spread. Bear Lake and Caribou County engines will remain on scene through the day to provide structure protection and additional wildland support. Fire crews are optimistic that 100% containment will be reached by Sept. 24, 2018. Over 80 individuals are assigned to this incident.